Transform the way your car looks and handles with our complete suspension solutions. Lowering Springs - reducing the ride height will enable the car to corner quicker and safer. Ride height can be reduced by 15-60mm, we can tell you the specific lowerings available for your car. Kits are available to lower the front more than the rear for an aggressive stance. We can also supply kits to suit cars with rear torsion bars (e.g. Renault). Extreme lowerings such as 60mm will require shortened sports shock absorbers. We can recommend the ideal springs for your make, model and budget. Shock Absorbers (also known as dampers) - settings on these range from very firm to near standard levels. Generally the firmer the setting the quicker the car will corner, however if the car is used on many different surfaces the firmer settings will probably cause the ride to be excessively harsh. Another consideration is that if the car is lowered it may be advisable to use specially manufactured shorter shock absorbers to compliment the shorter springs. Some shock absorbers are adjustable to enable them to be set from very firm through several levels to a softer more standard level. This can often be done with the shock absorbers still on the vehicle e.g. by adjusting a knob on the top of the shock absorber itself under the bonnet or in the boot. Suspension Kits - in essence these are complete kits of shock absorbers and lowering springs tailored to specific cars. They are available in various forms: Sports Kits... Uprated but replacement style kit. This is the same format as the original equipment items. It will be a straight replacement but will feature special shock absorbers that will be uprated and designed to work with springs that give a lower ride height. The shock absorbers in some kits will be adjustable to make them softer or firmer depending on the use the car is being applied to. Coilover Kits - these use different technology and the springs are integral to the shock absorbers. They are ideal if you require to change the ride height for track or show use. Infinitely adjustable for not only ride height but also, in some cases, the firmness of the shock absorber. Polyurethane Bushes - standard bushes deteriorate with age and can now be replaced with polyurethane versions. They will transform the feel of your car no end giving a more controlled and crisper driving experience plus they will not deteriorate with age. Available for most applications. Ideally these should be fitted when other suspension work is being carried out. Strut Braces - these act as a solid connection between the two strut tops, this keeps the suspension geometry correct and ensures consistent tight handling. Carnoisseur have a full range of Air Ride. To view the Air Ride we offer simply make your selection below. 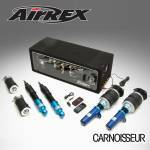 You can purchase Air Ride on-line or through our network of Carnoisseur Outlets. To find out more about Suspension click here to view our Carnoisseur Suspension Guide.